British rock bassist, singer, songwriter, DJ, writer, promoter, previously in Joy Division and New Order and co-founder of the FAC251 venue in Manchester. (A.K.A. Hooky). His unique bass-playing style can be sampled on recommended releases by Joy Division ("Disorder", "Love Will Tear Us Apart", "Glass" and "Exercise One"), New Order ("Everything's Gone Green", "Ceremony", "Regret" and "Weirdo"), Revenge ("Kiss The Chrome") and a few selected Monaco/Freebass/Hybrid releases. He released the book "How Not To Run A Nightclub" in 2009 (about the Hacienda), then opened a nightclub/live venue (FAC 251) in 2010. 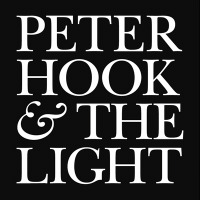 Hook formed the band The Light in 2010 as a means of performing Joy Division and New Order catalogue live.